WASHINGTON (Reuters) – In unusually frank comments, the top U.S. intelligence official acknowledged on Wednesday that spy agencies can target for killing Americans who are involved in terrorism. “We take direct action against terrorists, in the intelligence community,” Dennis Blair, director of national intelligence, said. “If … we think that direct action will involve killing an American, we get specific permission to do that,” he told the House (of Representatives) intelligence committee. Blair did not mention where the permission came from. The Washington Post reported last week that President Barack Obama approved a December 24 strike against a compound in Yemen where a U.S. citizen, Anwar al-Aulaqi, was believed to be meeting with regional al Qaeda leaders. He was not the focus of the strike and was not killed, but is now on a list of targets, the newspaper said. The American advisers in Yemen do not participate in raids but help plan missions and provide weapons, the newspaper report said. The CIA and the U.S. military’s Joint Special Operations Command maintains lists of individuals they seek to kill or capture, and both lists included at least three Americans, The Washington Post said. The comment on American targets in a public setting is highly unusual from a current intelligence official and even the congressman asking the questions was caught by surprise. In making such decisions, “whether that American is involved in a group that is trying to attack us, whether that American is a threat to other Americans, those are the factors involved,” Blair said. “We don’t target people for free speech. We target them for taking action that threatens Americans,” he said. “I’m actually a little bit surprised you went this far in open session,” Republican Congressman Peter Hoekstra said. (CNN) — Ten U.S. Muslim organizations threatened this week to cease working with the FBI, citing “McCarthy-era tactics” by the agency, including efforts to covertly infiltrate California mosques. 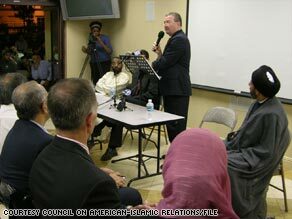 Stephen Tidwell, then of the FBI’s Los Angeles office, speaks at the Islamic Center of Irvine in 2006. The FBI declined to comment on specific allegations but called the proposed move unproductive.